The Dmitry Orlov story is a long one, but is finally in Washington D.C. like Capitals’ fans and most importantly Orlov have been hoping for. The 22 year old Russia native is seeing substantial NHL ice time for the first time since the 2011-12 season, where Washington’s 2009 second round pick played in 60 games and contributed 19 points. Of late, Orlov is seeing top four minutes with the offensively skilled, but defensively inconsistent Mike Green, a longtime Capitals blue liner. 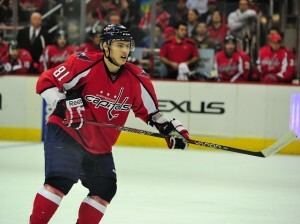 Although he hasn’t racked up the points with only one point in 11 games, Orlov’s presence has been evident. He has loads of potential and could be the top four defenseman the Capitals have been searching for. A top six defensive group consisting of Mike Green, John Carlson, Karl Alzner, John Erskine, Steve Oleksy along with Orlov could bring stability to the Washington defense. The return of former Nashville Predators blue liner Jack Hillen off injured reserve would bring healthy competition for the third defensive pairing on the Capitals moving forward. Orlov’s potential has always been there, but he’s now starting to play like Capitals’ scouts have hoped and what many have seen in the AHL over the past two seasons. Watch below as Orlov uses his quick trigger to find the net for his first goal of the season. Although the puck changed direction, this is an example of the young defenseman’s ability to get the puck on goal and generate offense. He’s fourth of all active Capitals defensemen in time on ice (TOI) per game, averaging 18:30 minutes per game. His ability to stay out of the penalty box has been key as well, recording only one minor penalty at the NHL level in 11 contests. According to Hockey Analysis, Orlov has played 53:16 minutes with Green during five-on-five play. That pairing has resulted in one goal together and a 50.5 CF%. When apart from Green during the same situations, Orlov has only a 44.5 CF%. He has yet to develop chemistry with a lot of the Capitals’ forwards, but has strong CF% ratings with Eric Fehr (57.6), Mikhail Grabovski (57.1) and Troy Brouwer (58.7). You shouldn’t read a whole lot into that success with that trio, due to a small sample size and not playing with each other a whole lot. He’s had more puck possession when on the ice when Washington’s secondary offensive weapons rather than the Capitals’ top forward line consisting of wingers Marcus Johansson and Alex Ovechkin along with center Nicklas Backstrom. Below Orlov shows exceptional patience in Washington’s contest game against the Philadelphia Flyers, bypassing on a shot attempt at the point to find defensive partner Mike Green near the right circle for a clear shot at the net. Orlov has yet to see much time on the power play, but it’s another part of his game that could be displayed if he continues to play well with Mike Green. Orlov has a powerful slap shot that was utilized with the AHL’s Hershey Bears aplenty, especially on the man advantage. His speed brings another dimension to the Washington Capitals. They don’t have many left handed defensemen in their system that can skate just like he does. There are flaws in his game, like every other player, but he has the potential to be a top four defenseman and is starting to show signs of it. He’s a strong hitter in both the open ice and near the boards and has often used a strong hip-check in the AHL, but not as much in the NHL to this point. In the game highlight below, Orlov’s movement is obvious in a game against the Florida Panthers earlier this season. He takes a pass from winger Martin Erat and shifts his body very quickly to create a better angle at the net while winding up to fire a slap shot on the Panthers’ net minder. Head coach Adam Oates has made a sound decision in pairing him with a veteran defenseman in Mike Green, even though Green has been somewhat of a liability in his own end recently. Oates’ forward combinations have been puzzling to a large portion of media and fans, but he has guided his club into position for another shot at the Stanley Cup playoffs which is all Capitals’ ownership and General Manager George McPhee can hope for even though there have been struggles in the 2013-14 campaign.